With the 27th pick in the 2014 NHL Entry Draft, the San Jose Sharks selected right wing Nikolay Goldobin. The Sharks traded down from the 20th overall pick with the Chicago Blackhawks to select Goldobin who led all OHL rookie’s in scoring and also led his team in scoring. The Russian factor was in play during the draft as only two Russians were taken in the first round. Goldobin is the first Russian born player drafted in the first round by the Sharks since 1996. San Jose has selected a mere two Russian or Soviet born players in the past 17 drafts, all of which were after the fifth round. Russian/ Soviet players drafted by San Jose from 1997-2014. 2011- Daniil Sobchenko. Round 6. Pick 166. 2013- Emil Galimov. Round 7. Pick 207. 2014- Nikolay Goldobin. Round 1. Pick 27. The reason that the Sharks have not made a gamble on Russian players in nearly two decades is because of their mistake in 1996. The Sharks drafted defensemen Andrei Zyuzin with the 2nd overall pick in 1996 making him the highest drafted player in franchise history along with Pat Falloon and Patrick Marleau. Unfortunately, Zyuzin did not have a successful NHL career and spent only two seasons in San Jose where he had more penalty minutes than games played. Zyuzin went on to play for six teams while in the NHL and was demoted to both the IHL and AHL on multiple occasions. He was not a complete bust as he played nearly 500 games in the NHL before leaving in 2009 but is considered one of the worst 2nd overall draft picks in the past 30 years and one of the worst first round draft picks by the San Jose Sharks in franchise history. 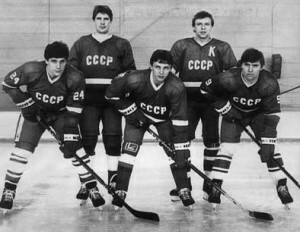 Sergei Makarov, and Igor Larionov completed the feared KLM line with Vladimir Krutov while playing for the USSR. Before Andrei Zyuzin, San Jose was once a haven for Russian and Soviet born players. From 1991-1996 the Sharks selected 12 Russian or Soviet players. Notable players drafted by the Sharks include enforcer Andrei Nazarov, center Viktor Kozlov, right wing Alexander Korolyuk and goaltender Evgeni Nabokov. San Jose also acquired two superstars from the USSR, Igor Larionov and Sergei Makarov in 1994. Both played key roles in the 1994 and 1995 seasons when the Sharks upset the Red Wings and Flames in the playoffs. During the first decade of the the franchise these players helped play a role in turning the Sharks into a successful organization. Russian/ Soviet players drafted by San Jose from 1997-2013. 1991- Mikhail Kravets. Round 12. Pick 243. 1992- Andrei Nazarov. Round 1. Pick 10. 1992- Alexander Cherbayev. Round 3. Pick 51. 1993- Viktor Kozlov. Round 1. Pick 6. 1993- Aleander Osadchy. Round 4. Pick 80. 1993- Andrei Buschan. Round 5. Pick 106. 1993- Anatoly Filatov. Round 7. Pick 158. 1994- Alexie Yegorov. Round 3. Pick 66. 1994- Alexander Korolyuk. Round 6. Pick 141. 1994- Sergei Gorbachev. Round 7. Pick 167. 1994- Evgeni Nabokov. Round 9. Pick 219. 1996- Andrei Zyuzin. Round 1. Pick 2. The Sharks have not drafted a solid player from Russia since 1994 but Nikolay Goldobin’s story is very different than all of the Russian players drafted before him. The biggest difference is that he decided to move to North America to play in the OHL instead of staying to play in Russia. The driving factor behind this decision is the man that represents him, Igor Larionov. The Same Larionov that played for the San Jose Sharks in the NHL. Igor Larionov’s resume includes three Stanley Cup rings, two Olympic Gold Medals, numerous medals in the World Championships, World Juniors and Canada Cup as well as being inducted into the Hockey Hall of Fame. He was one of the first who helped pave the way for Russians to succeed in the NHL. If Goldobin was not Russian he would have been taken in the top 10. He finished sixth in OHL scoring and was the runner up for the OHL rookie of the year award. Despite Goldobin’s offensive talent he has to improve on the defensive side of the puck as he finished a minus 30 last season with Sarnia Sting. Despite his defensive flaws he has the potential to be a top six winger. The risk he carries is high but the reward is even higher. Having one of the best Russian players in history, Igor Larionov, as a mentor will make his chances of success much greater. Larionov’s connection with the Sharks and the fact that Goldobin has played in North America for two years already should make the transition into the NHL easier. In a few years we could be looking back at the 2014 draft saying that not only was Goldobin a steal but perhaps the best player taken in the 2014 NHL Entry Draft.